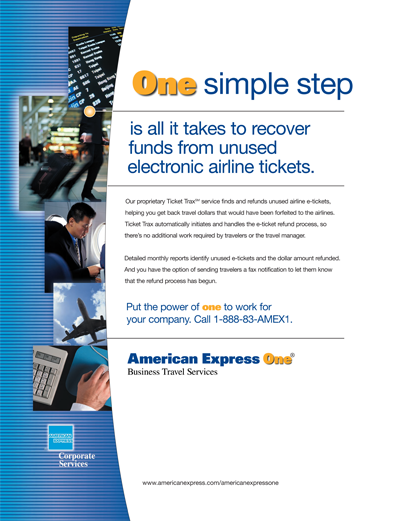 American Express One was a new travel division geared exclusively for small and mid-sized businesses and wanted an ad campaign that would counter the impression that the travel company was “too big” for this demographic. We wrote a trade magazine ad campaign that reflected the entrepreneurial spirit of the client’s target audience, using big, bold, one-word headlines and minimal tongue-in-cheek copy. 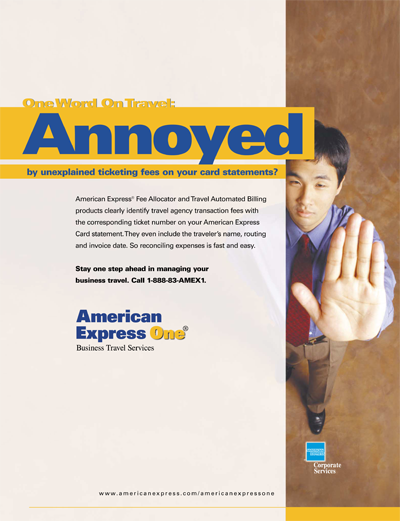 As American Express One became more known, we wrote a follow-up trade advertising campaign with short catchy headlines that played on the word “ONE” to further promote the brand’s identity. In fact, these ad campaigns helped American Express One become one of the most profitable divisions of the entire American Express organization at the time. Taking this campaign online, we created a series of banner ads that reinforced the American Express One brand and highlighted service and savings—two key benefits important to their target audience.